The delicately cambered curves and perfect proportions of the stainless steel “tonneau” case provide an ideal backdrop for the Architects of Time to showcase their subtle sense of style and distinction. Interpreted in a generous 31.40mm-diameter version, the barrel shape exudes a uniquely sensual charm that is accentuated by the progressive gem-setting, which appears to its best advantage thanks to the carefully graded sizes and shades of the gemstones. 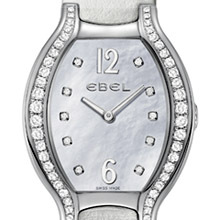 The hour and minute hands move gracefully across the square settings of the diamond hour-markers, illuminating the shimmering mother-of-pearl dial and forming a delicate frame for the Arabic numerals at 12 and 6 o’clock and the applied Ebel logo. The numerals are skeletonized and highlighted by Super-Luminova in a beautiful palette of colors (white, yellow, orange, pink or purple) to match the sparkling choice of brilliant-cut gemstones embellishing the case (diamonds, citrines or sapphires) and the shade of the ostrich leather strap. 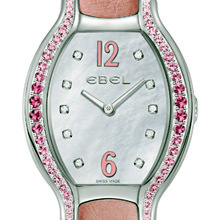 This choice of material is a first for Ebel and lends a fine exotic touch to these refined watchbands fitted with a polished double folding clasp. Radiating an aura of refined taste as expressed through esthetic elegance and purity rather than showy sophistication, the Beluga Tonneau Large proves itself entirely in tune with the times.